If you're like me you're a bargain hunter, and enjoy wandering the aisles of our local Salvation Army Family Store or going to garage sale each month to see what sort of awesomeness you can find. You may also be concerned about what you are bringing into your house especially if you have young kids in the home that chew on everything. I've developed a few fool-proof ways for cleaning our favorite finds and thought I'd share my secrets. Some toys are too big for the washer. Or, they have electric parts. Those get a scrub with some all-purpose cleaner. I use an antibacterial multi-surface scrub on these items, and then, because I'm sort of a clean freak when it comes to kids toys, I cover everything with a coat of Lysol. Or in this case, the bargain brand version. Books also get a wipe down with a disinfecting solution if possible, and sometimes even a spray with Lysol. Obviously, I can't do that with paper, but it can be done on the kid's board books, and covers of books I am going to read. Same goes for puzzles or games. I just spread things out on the garage floor and spray away. 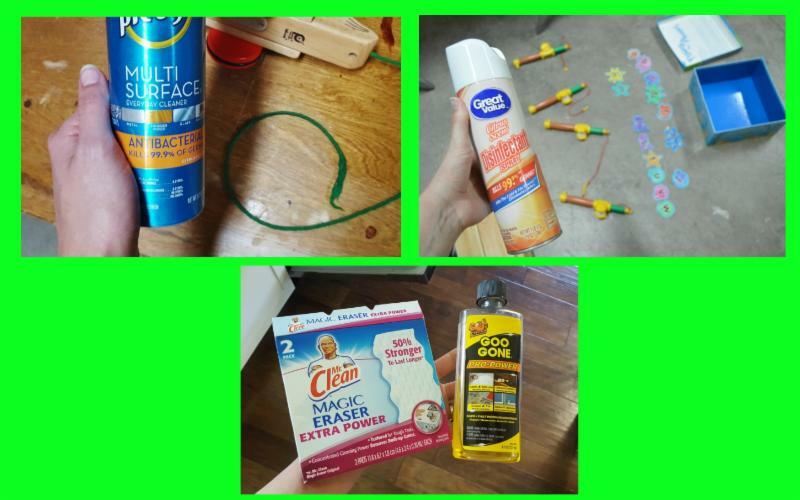 A little Goo Gone (or WD-40) is also your best friend for removing yucky sticker residue from books and other items. Seriously, this stuff is a lifesaver. Just be careful using it on anything where it can be absorb. It's oil-based and will stain if it soaks into the pages of a book. Oh, and a magic eraser will remove most marks (crayon, pencil, ink) from children's books and toys. It works best on cardboard, but if used carefully can remove marks from paper, too. Just make sure it isn't too wet and you don't rub the page hard enough to rip or wrinkle it. Occasionally, I bring home things that just can't be cleaned. In those instances, I either call in the professionals by paying to get it dry-cleaned, or I get creative. However, I will say that I VERY RARELY get things dry-cleaned. Maybe I made this up or heard it somewhere, but most things that say "dry clean only" usually do okay in the wash. Either way, I have washed a lot of things in our washer that aren't "supposed" to be. It usually works. I've only ruined two things in eight years. Just use a gentle cycle, and maybe a laundry delicate bag on cold water, and then hang dry. Now let me give out a warning: Sometime we pay the price for being too thrifting and not going to the professionals to get things cleaned and it gets ruined. 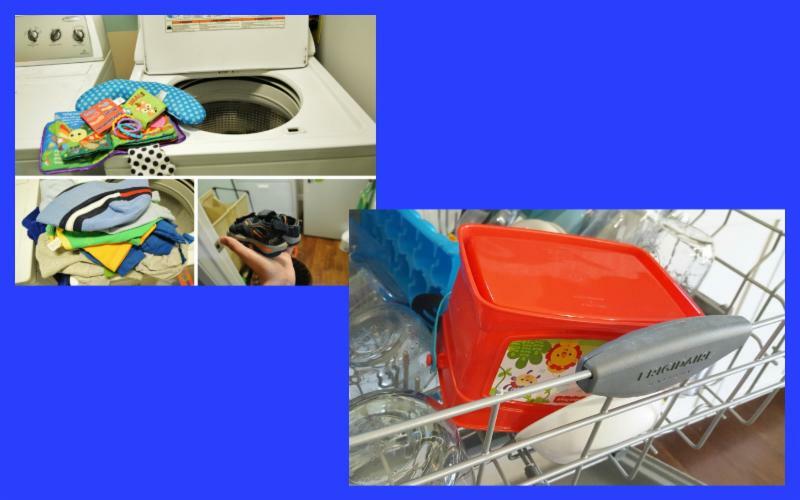 One final tip for "cleaning" secondhand items is to freeze them. Yep. Put them in the freezer. Even though it looks clean, you may have questioned is it. 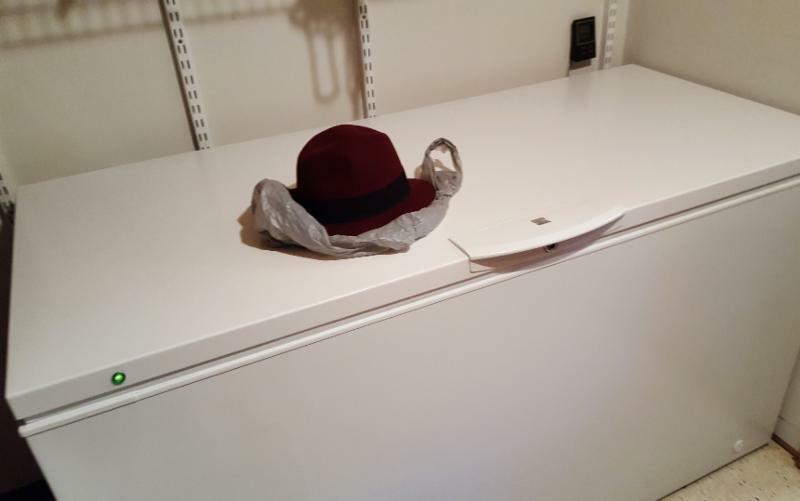 If the drycleaners won't touch it, just spray it with Lysol and stick it in the freezer. A few weeks on ice will kill any nasties that might be lurking on it and make you feel better about wearing something that was probably fine to begin with. This also works for pinecones or other things you bring in from the outdoors that might have bugs on them.